To weigh: Weight Watchers does - every week. If you are a lifetime member you have to stay within a small range of your goal weight to remain a lifetime member. I used to weight myself everyday... naked. I was obsessed. If I was dieting, I'd watch the scale go down if I was not dieting I'd watch the scale go up. I used to call Rachel every Wednesday night after my weigh in and report. We bonded over my weight watchers experience. Not to weigh: Intuitive Eating says to lose the scale. I threw mine away. I'm committed to becoming an Intuitive Eater but I have a few relapses. Last week at the gym I weighed myself - the scale was right there in front of me and I let my curiosity get the best of me. I was exactly what I thought I was - what I was when I last weighed myself two months ago. This morning I woke up feeling trim - well at least not fat. I've been trying to eat intuitively for awhile now and I'm starting to catch on. I wanted to weight myself to see if I really am losing weight. NO! Respect your body - reject the diet mentality. If I weighed and I had lost weight, I'd start to become obsessed with the scale again. If I weighed and I hadn't lost weight then I'd be sad and the happy good feeling I woke up with would be gone. It's all about how you feel. Rejecting the diet mentality will take sometime - they say that breaking up is hard to do. Will I ever step on the scale again? 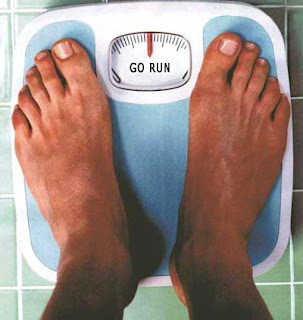 I weigh myself every time I go to the gym. Because I have to. There's this rule. Good thing I don't own a scale and I don't really ever go to the gym. Hey, if your scale is still in the garbage, do you think I could have it?? Sorry Karen - I really gave my scale to D. I. - you could probably go and find it and purchase it if you wanted to.